We have been following Peter Alfonso’s work ever since the beginning, so whenever we see him pump out new ROMs, we like to give them some spotlight. This release is Bugless Beast for the Galaxy Nexus. Downloads for the ROM have been available for a bit now, but with him constantly updating it and there even being nightlies, we figured we should point everyone to the newest and best download that’s available. 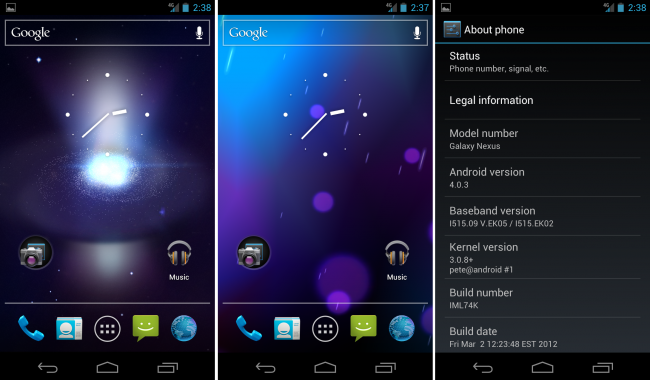 Pete’s ROMs are known for their stability and excellent selection of customizations. It may not have as much razzle-dazzle as the AOKP, but this ROM can keep up with the best of them. There are some added live wallpapers, 180 degree rotation, and the notification bar toggles straight from AOKP. You can view the full changelog here. You must be rooted to attempt the following installation! Download the Bugless Beast zip file. Place zip on your phone’s storage. Create a nandroid backup immediately before proceeding. Locate BB zip file and then install. Reboot and enjoy the wonders. If you have any questions or concerns, place them down below in the comments section and we will do our best to help you out. Owners of different devices can also get in on the Bugless Beast action by checking out Pete’s large library of ROMs on his site. Have fun and good luck.